During the war, many white Southerners repeatedly refer to the “Cause” of the South, a reference (sometimes blatant, and at other times thinly-veiled) to the preservation of African slavery, the economic and social foundation of the Confederacy. Many white Christians of the South insist that the Southern “Cause” is the will of God, a view that is also generally held amongst the Southern white populace at large. “Liberty” and “human rights” are privileges of the white race alone. Baptist elites, and many non-elites, do their part to uphold the dominance of the white race. In letters, journals, diaries, minutes of Baptist meetings, and published editorials, the “Cause” is diligently defended (even as some Baptists at times warn that slave owners should avoid cruelty in their treatment of their chattel). In short, the messaging of the “Cause” has been and is a daily part of Baptist life of the South. 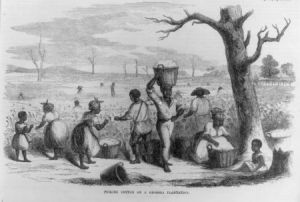 While repetitious and seemingly monotonous at times, the constant reminder of the mission and identity of the South is imperative: should African slaves be granted liberty and rights, Southern economy and society will fall apart. This week North Carolina Baptists’ Biblical Recorder publishes an editorial entitled “Faith in our Cause Necessary to Success.” The piece is making the rounds of the Baptist press of the South. It is typical of the constant rhetoric circulating in white Baptist life on a daily basis, tweaked for the immediate war time circumstances–in this case, recent battlefield reversals and a string of Southern cities falling to Northern armies. It can not be denied that the reverses which our arms have suffered for a few months past have had a most depressing effect upon the minds of many of our people. True, most of them believe firmly in our final success, but there seem to be few who look for speedy triumphs. This we think most unfortunate, for that is not faith which agrees to the indefinite postponement of complete victory over our foes–but is a sort of intangible hap-hazard hope that something favorable may turn up. But if we are overcome in detail, how can we hope for the general result to be favorable? Will the enemy give up voluntarily, and without a struggle, the places which we have abandoned to him? No one who understands the views and feelings of the Lincoln government can believe this for a single moment, but, on the contrary, must be well assured that every foot of territory, which we lose must be regained vi et armis. What then is the duty of the people? Evidently to look for immediate victories, and the repossession of much that we have lost in territorial jurisdiction. If we ever drive out our invaders and re-establish our authority in those Southern States now under their control, it must be through the blessing of God upon our side. If this be true, why then may we not have that blessing as well now as a year hence? If our cause is just (and of this we are all sure,) will not the Lord give us the victory at once unless there is something in the manner in which we are conducting the struggle to prevent this result? If there is any thing of this sort, surely it must be the want of faith in many of our people. We must cherish an abiding confidence in our cause and in the God of our country, or else we shall strike with a nerveless arm in the defence of all we hold hear on earth, and our efforts will be put forth only to fail. We must feel that we have a Heaven-appointed mission to perform a divinely-arranged destiny to fulfill, if we would gain the prize for which we contend. It was this conviction which made Joan of Arc the scourge of her country’s foes–which rendered the followers of the Crescent invincible for so many centuries–and it was their unfaltering trust which enabled our Revolutionary sires to achieve our independence. It now becomes every man, woman and child in this Confederacy to cherish unwavering confidence in our success and such a feeling ought to be the self-erected standard of our loyalty to our country, its interest and its honor. Property, comfort, life itself, should be given up rather than submit to outrage and dishonor. Let the noble sentiment, “Millions in defence–not a cent for tribute,” animate every bosom; let a firm religious trust dwell in every heart, and our foes can not subdue us even though their numbers and resources were duplicated. “Eight millions of people armed in the holy cause of liberty, in such a country as that which we possess,” and with the God of battles on our side, “are invincible by any force which our enemy can send against us.” We are not fighting our battles alone, but we are contending for the great principle of self government, in which all the nations of the earth are interested. Generations yet to come are to reap the fruits of our toils and sacrifices, and for their sakes, as well as our own, we sought to stand by the cause in which we are engaged even to the last man; and if human rights must perish on the American continent, let us expire upon the same funeral pyre.